Overnight oats are perhaps the ultimate breakfast for those who claim not to have time in the mornings for what's been described as "the most important meal of the day". As the name suggests, they are prepared in advance and I personally like to make them in a jar so that I can simply add the lid and grab & go in the morning. There's a few recipes on here for overnight oats but these are my current favourite- the vibrant pink colour alone makes them a breakfast worth getting out of bed for! 1) Pass the ginger, followed by the beetroot through a juicer. 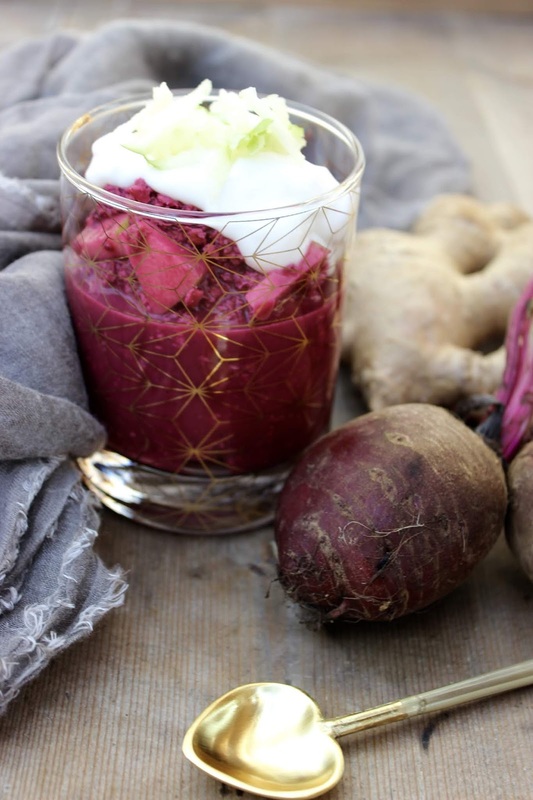 2) Place the oats in a bowl and stir in the ginger & beetroot juice, along with the coconut milk, to combine. Cover and refrigerate overnight or for at least 6 hours. 3) In the morning, stir the oats. Add the chopped apple, stirring to combine. Serve topped with the coconut yoghurt.